You can see that GFS has the storm quickly moving past us and then stalling out bringing cold snow to the area on Monday. 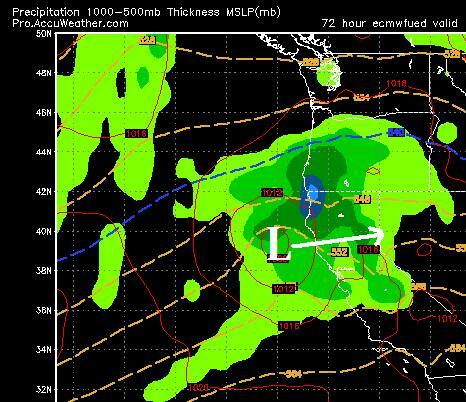 EC has the storm hitting later, with the precip on the front end, which of course would be mean heavier, wetter snow. Regardless, both models are calling for only about an inch of precip in the Sierra and about half that for the Carson Range. My initial forecast is 4-12 inches for Slide Mtn and 1-2 feet for the Sierra Crest by Tuesday morning. As the storm cycle dies out, there is some uncertainty about next week's storms. The best guess now is Friday March 11th. 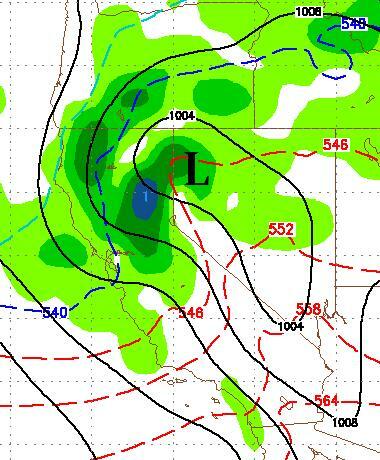 Both EC and GFS long range forecasts are downplaying the size of this storm. Both models have a large ridge of high pressure moving in to our south and west, better known as Ridge City on or about the 14th of March. These high pressure ridges, can signal a long period of warm stable air with storms moving far to our north. I will fine tune these forecasts and Sunday/Monday's forecast in the coming days. I posted a video on the Davis Creek run a few days back. I want to stress that this run is for experts and should NOT by any means, be taken lightly. This area of the mountain is outside the ski area and is considered expert terrain. The area is known to slide and if it does, you do not want to be anywhere near it. Be sure that you understand the risks, before attempting this run.